An extraordinarily gifted person with the scholarly bent of a Madame Curie and the compassionate soul of a Mother Teresa, Maria Montessori was always ahead of her time. Despite cultural taboos, she graduated from medical school in 1896 to become Italy's first female doctor. Initially, she took care of children's bodies and their physical ailments and diseases. Then, her natural intellectual curiosity led to an exploration of children's minds and how they learn. She believed that environment was a major factor in child development. Appointed Professor of Anthropology at the University of Rome in 1904, Montessori represented Italy at two international women's conferences: Berlin in 1896, and London in 1900. From 1913-1915, she traveled to America, making friends and participating in the Panama-Pacific International Exhibition in San Francisco. In 1922, she was appointed Inspector of Schools in Italy. She lost that position when she refused to have her young charges take the fascist oath as the dictator Mussolini required. Dr. Montessori visited the U.S. in 1913 and impressed Alexander Graham Bell - who founded the Montessori Education Association in his Washington, D.C. home. Her American friends also included Helen Keller and Thomas Edison. In 1915, she designed an exhibit at the Panama-Pacific International Exhibition in San Francisco. Amazing to visiting educators, it featured a glass class room which allowed people to observe her teaching methods. She also conducted training sessions and addressed the National Educators Association and the International Kindergarten Union. Dr. Montessori was a teacher of teachers. She wrote and lectured unceasingly. She opened a research institute in Spain in 1917 and conducted training courses in London in 1919. She founded training centers in the Netherlands in 1938 and taught her methodology in India in 1939. She established centers in The Netherlands (1938) and England (1947). An ardent pacifist, Dr. Montessori escaped harm during the turbulent '20's and '30's while advancing her educational mission in the face of hostilities. Dr. Montessori was nominated three times for the Nobel Peace Prize - in 1949, 1950 and 1951. Maria Montessori was profoundly influenced by Fredrich Froebel, the 'inventor' of kindergarten, and by Johann Heinrich Pestalozzi, who believed that children learned through activity. She also drew inspiration from Itard, Seguin and Rousseau. She enhanced their approaches by adding her own deeply felt belief that we must 'follow the child'. One does not teach children, but rather creates a nurturing climate in which children can teach themselves through creative activity and exploration. Maria Montessori wrote over a dozen books. The most well known are The Montessori Method (1916) and The Absorbent Mind (1949). Dr. Montessori taught that placing children in a homelike and stimulating environment, e.g., the "Children's House," will encourage learning. She saw the traditional teacher as a 'keeper of the environment' who was there mainly to facilitate the children's self-conducted learning process. She did not permit any form of corporal punishment or demeaning behavior in her class rooms. The Montessori Method got its start with the opening of the original Casa Dei Bambini in the slum district of Rome known as San Lorenzo. Montessori took fifty hopelessly deprived ghetto children and awakened them to life's excitement and possibilities. Within months, people came from far and near to see her in action and to learn her strategies. She founded the Association Montessori Internationale in 1929 so that her teachings and educational philosophy would flourish in perpetuity. 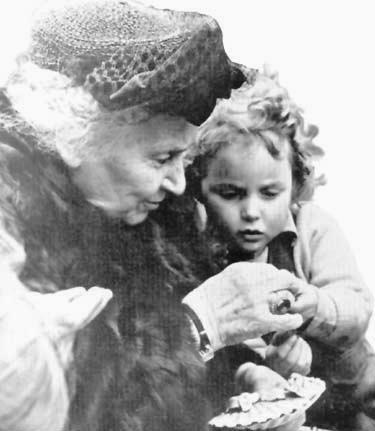 Dr. Montessori's pioneering work with children's education began at the beginning of the twentieth century. One hundred years later, her philosophy and approach remain remarkably fresh and in tune with modern minds. In particular it resonates with parents who seek to stimulate their children through creative activity and exploration in all its forms. Children educated in the Montessori manner know who they are as people. They are confident, at ease with themselves, and interact on a high social plane with their peers and adults. Montessori students are naturally curious about their surroundings and are eager to explore anything and everything. They go on to adulthood ready to make a contribution to society. After her death in 1952, two members of the Montessori family continued her great work. Her son, Mario, directed the Association Montessori Internationale until his death in 1982. Recently her granddaughter Renilde has been active as Secretary-General of AMI. Truly, Montessori education is a family affair.